Choosing a wardrobe of basics for your layover will help you deal with space limitations. Select clothes that will coordinate with each other. Try to stick to one color scheme (black/brown/navy) or select clothes that can be mixed and matched. Bring clothing that requires little care … wrinkle-resistant, quick drying fabrics. Check seasonal weather conditions where you will be traveling and be prepared. To save space and weight, prepare a kit of miniature toiletries in small plastic bottles. Don't fill bottles to the top, because the pressure may cause contents to expand. Pack bottles in plastic bags should there be leakage. As an alternative, many stores sell travel size toiletries, which are small and do not use up excessive space. Pack heavy items on the bottom of the suitcase to avoid wrinkles. You may also want to stuff any packed shoes with underwear or socks to save space, or prevent them from being crushed during your travels. Roll pajamas, nightgowns, sweaters and other casual wear to fill small spaces, when possible, BUT don't cram your suitcase full. If you have to force your luggage closed, remove a few items to prevent broken hinges or zippers along the way. Try the "interweaving method" of packing for your next trip. Drape longer garments such as dresses and pants across the suitcase with the ends hanging over the sides. Then, fold shorter items such as jackets, shirts and blouses around the longer garments so that they cushion each other. Be sure to include your name and domicile on a tag fastened securely to the outside of your luggage. 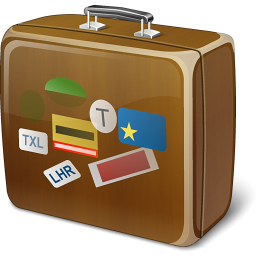 You may also want to identify your luggage on the inside with your name, address, telephone number and domicile.